New to gravel riding? Well, that makes two of us. Last year’s first-ever GRAVEL ride was the first time I dipped my toes into this new (to me) world and I had a blast doing it. A few months after the GRAVEL event the guys at Cycle Oregon invited me to head down to Dufur and test out this year’s route. Did I take them up on the offer? Yes I did. We took off from Portland on a rare dry day in mid December and headed up the Gorge. As we drove past The Dalles and started headed south towards Dufur we were suddenly in fog so thick you could eat it with a spoon. On top of that, it was drizzling and threatening to rain. This did not bode well for the prospect of taking any pictures during our ride, but luckily the farther we drove down into the rolling plains surrounding Dufur, the less fog there was. By the time we arrived at the campgrounds where CO basecamp will be set up this year, the outlook was crisp, clear, and dry. After suiting up and a pumping up the tires, we were off. And speaking of tires…on those winding Tillamook Forest logging roads I rode a mountain bike with big ‘ol tires and front suspension, which proved to be a pretty good choice for the mud and the drizzly weather. On this day in Dufur I brought my road bike with 25mm tires since the course calls for roughly 50% gravel and 50% road riding. The bike worked great, but I did wish I had a little beefier tires to help negotiate some of the rougher parts. I’ll definitely be riding 28s on my bike come May. On the rough stuff I just clenched my teeth, took it at a comfortable speed, and tried to stay vertical. And I did! One thing that surprised me was the variety of aggregate we rode across. There were corners that were washed out with larger fist-sized rocks. There were sections of gravel that were deep and loose. And there was hard packed areas that were nearly as smooth as a paved road. There really was a little bit of everything. It was all doable though, even for a newbie like me. I found the gravel sections to be just challenging enough with the sections of road riding making for a nice balance to the day. The route itself was a joy. We were all by ourselves out there except for the occasional tractor, winding our way along the historic farm and ranch land at the foothills of Mt. Hood. With sweeping mountain vistas – Hood, Jefferson and Adams – around every corner, there was never a shortage of scenery. And when I wasn’t contemplating the distant mountains I found myself thinking about the people who brought their wagons through here all those years ago on the nearby Barlow Trail, the kids who went to school in the abandoned school houses, and the families who spend each Sunday in the weather beaten barely-standing churches. What would they think of these guys out here in neon gear riding these roads just for the fun of it? Was eye rolling a thing back then? Another sight that caught my eye were all the burnt up fence posts and tree stumps, charred reminders of the area’s more recent past following the devastating South Valley, Long Hollow, and the Substation fires. But this land is a resilient one, and so too are the people who work it. Everywhere you look are already subtle signs of a comeback. The day I spent in and around Dufur has me really looking forward to this year’s GRAVEL event. 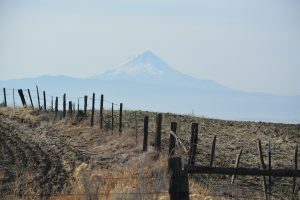 I’ve cruised past Dufur on my way to the Deschutes many times, but I never thought to stop and poke around. I’m really glad I finally had a reason to explore the area and I’m even more glad I have a reason to come back again. 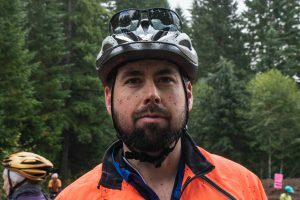 The 2019 GRAVEL event takes place May 17-19, click here to learn more and register. Thanks for the shout out for Dufur! Its a hidden gem–so close yet feels so far. We’re sorry we missed you when you rode through, but we’re looking forward to having you for the Gravel Ride here in May. Hoping folks know to stop into the Balch Hotel (a Travel Oregon Bike Friendly designation, rated #10 Top Travel Destination in Oregon) as well as stopping in Kramer’s Market, a gorgeous old-timey general store, and We3 for Ice Cream and coffee treats! 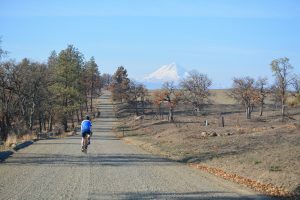 Dufur has miles of gravel and road riding with little traffic, gorgeous views and ample sunshine. Can’t wait to meet you!